Guy S. Emerich and Jack O. Hackett II selected to The Best Lawyers in America© list 2017. 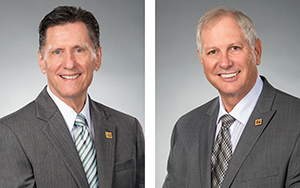 PUNTA GORDA – August 16, 2016 – Guy S. Emerich and Jack O. Hackett II, directors at Farr Law Firm, were recently selected by their peers for inclusion in the 2017 Edition of The Best Lawyers in America©. Emerich was recognized by Best Lawyers© for his work in Trusts and Estates and has received this honor for eleven consecutive years. He is Florida Bar Board Certified in Wills, Trusts and Estates, and his practice focuses on estate planning, probate and trust administration, with an emphasis on protecting and preserving his clients’ assets, minimizing taxes and avoiding probate. In 2016 Emerich was recognized by Best Lawyers© as the Trust and Estates “Lawyer of the Year” in the Fort Myers metro area. Hackett was named by Best Lawyers© in the practice of Real Estate law. As a Florida Bar Board Certified Real Estate attorney, he represents clients in all areas of residential and commercial real estate sales, acquisition and development and has represented clients in several high profile real estate transactions. Hackett also practices business law and counsels clients in a wide range of industries in the formation, organization, and management of business entities.